DV’s proprietary pressure lubrication process provides controlled lubrication to all critical areas by means of oil ring pickup. All cylinders are precision honed and machined to exact tolerances, reducing wear and friction. Balanced crankshafts and precision ground journals, combined with heavy-duty ball-type main bearings, provide smooth, free-running operation. Dynamically balanced, Airfoil-Type Flywheels provide a continuous flow of cooling air over all parts of the compressor. Short stroke load matched pistons, combined with high quality alloy steel disc-type valves permit cool operation and maintenance-free service. The Two Stage, Two Cylinder 247 & Two Stage, Four Cylinder 447 Compressor Pumps Feature Cast-Iron Construction & Slow RPM, Making Them Ideal for Demanding Industrial Environments. The 247 & 447 are Precision-Machioned, Honed, Manufactured & Assembled in Canada. Minimizes Distortion from Assembly Torque & Heat. Precision-Machined Cylinder Walls Honed to reduce Friction & minimize Oil Carry-Over & Friction. Extra deep fins provide increased cooling & strength. Heat-Treated & Stress-Relieved Connecting Rods Cast from Ductile Iron & Assembled with Babbit Bearings Increase Durability & Reduce Wear on the Crankshaft. High-Pressure, Cast-Iron Pistons withstand extreme forces. Low-Pressure Pistons made from aluminum alloy. Extra wide compression rings designed to work seamlessly with the oil control rings & scraper. Precision-ground journals furnished with inserts for long, trouble-free operation. Tapered shaft for reliable & effective transmission. Airfoil-type spokes provide continuous, cooling air flow. Machined, carbon-steel valves balance air passages & structural integrity. Individually tested & easily serviced. Quick Cooling, Deep, Directional Fins. 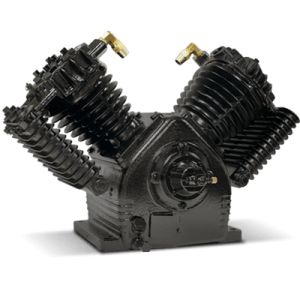 Fast, efficient flow of cooler intake air due to compact, streamlined air passages in the cylinder head. 10 HP & 15 HP Equipped with centrifugal pressure release (CPR) allowing the motor to start before a pressure load is applied to the pump. Large bore, short-stroke & slow operating speeds improves life expectancy & provides high air delivery. Complete with pressure gauge & CRN & ASME Approved safety valve. Oversized, Heavy load capacity ball bearings ensures a free-running crankshaft. Lubricated from the crankcase, requiring no maintenance.